HAIROUSE is the best way for covering bald patches and increasing your hair volume. This instant hair thickening product contains electrostatic natural microfibers(99%) made from plant cellulose. These electrostatic fibers easily attach to your natural hair by chemical bonding. HAIROUSE, instant hair thickening product, is 100% eco-friendly so that it is very safe for skin and hair. Unlike other hair camouflages made from animal source, HAIROUSE provides better result with lesser quantity of microfibers. HAIROUSE contains very less amount of chemicals (1%), and hence not going to damage your hair.These fibers are very useful in covering bald patches and increasing volume and thickness of hair and can be washed off by shampooing. Nithyasha Healthcare Pvt Ltd is a Mumbai based firm ,whose prime objective is to attain an admirable position in the field of health and beauty care. 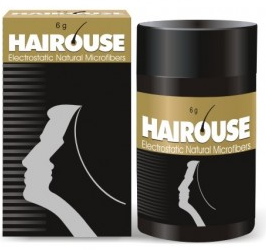 Use HAIROUSE containing electrostatic natural microfibers which instantly cover your bald patches and increase the thickness of the hair.